With about 180 species of honeysuckle throughout North America, Europe and China, there is sure to be a variety that will grow well in your garden climate. These plants generally grow as either vines or shrubs, and both can make excellent additions to your garden. Vining specimens can grow up to 25 feet in length, and the fragrant, trumpet-shaped flowers can be up to two inches long. Most birds like to eat the red or black berries. The leaves provide food for the larvae of many butterflies. Some parts of the plant are poisonous to humans if ingested. Bush-type specimens are upright shrubs that range from a few feet tall up to 15 feet tall. They tend to form many branches at the base. They are often grown as hedges or screening plants. They are useful as part of a shrub border. Lonicera nitida and Lonicera pileata are called boxleaf honeysuckle because their leaves resemble boxwood leaves. They respond well to pruning and are often used as hedges. See more types of honeysuckles. Honeysuckle has been valued as an ornamental garden plant for centuries. It is used as a ground cover or as a vine that hangs on fences, trellises, and arbors. 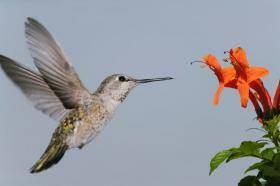 This plant can also be used to attract a variety of beautiful creatures, including butterflies and hummingbirds, which love to drink the nectar from the tubular blossoms. 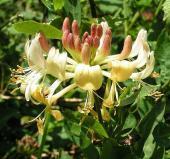 Most honeysuckles can grow in zones 4 to 8. All varieties need full sun to partial shade and moist, well-drained soil. In fact, these plants are not particularly fussy about their soil, and they'll grow almost anywhere they can get enough sun. First, till the soil to a depth of twelve to fifteen inches. Work three inches of compost into the soil. Next, dig a hole slightly larger than the root ball of the plant. Remove the plant carefully from its pot, and put it in the hole. Fill the hole so that the top of the root ball is level with the top of the ground. Water your plant once a week the first year after planting. After that, it will only need water during a drought. Fertilize your plant with a balanced fertilizer (10-10-10) at the beginning of the growing season; repeat halfway through the blooming season. Pruning times vary. If your plant develops blooms on new growth, prune in the winter when it's dormant. If the plant blooms on old growth, prune directly after the blooming stops, and prune only the areas that held blooms. Better Homes and Gardens lists three varieties as the most popular, including the common honeysuckle vine, Dropmore Scarlet, and Gold Flame. 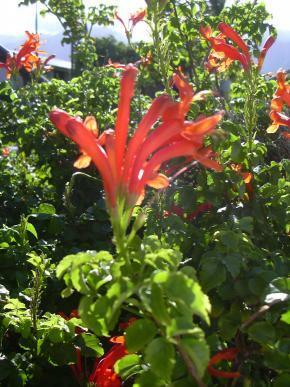 Other popular varieties include Cape honeysuckle and Winter honeysuckle. Drive down any country road in June or July, and the fragrance of thousands of honeysuckle blossoms is practically intoxicating. The common honeysuckle vine climbs fences, shrubs, trees and posts. The vine blooms with white or pink flowers. If the flowers are white, they change to a delightful golden yellow as they age. The common variety grows wild through most temperate zones in the United States. It can take harsh conditions, but it doesn't like to remain dry for too long. Dropmore Scarlet blooms with rich, crimson red flowers. Unlike the common variety which produces a burst of blooms to welcome summer, Dropmore Scarlet blooms continuously throughout the warm summer months, and its fragrance is lighter and less noticeable. It's just as hardy, however, and grows well in zones 4 through 9. Like the common honeysuckle, it is a vine that needs a fence, trellis, or some other support for growth. Gold Flame bears bright golden-orange flowers on a vine. Give Golden Flame plenty of room to spread. If it's happy with its conditions, it will attain 15 feet or more and provide you with plenty of fragrant flowers. It's hardy from zones 6 through 9 and, like Dropmore Scarlet, it blooms all summer long. The Cape variety's natural inclination is to grow and trail like a vine, but you can train it into a shrub-like form if you prune it vigorously each year. It's an evergreen, which makes it unusual among the honeysuckle family. The flowers are orange or reddish-orange. This variety needs the warmth of deep south or tropical zones 9 to 10. If it's left to grow as a vine, it will grow 25 feet long or more, so give it plenty of space and room to climb. Rounding out this list of sample varieties is the Winter honeysuckle. It gets its name from the fact that, like the Cape variety, it retains its leaves throughout the winter. However, unlike the Cape variety, the Winter variety can grow as far north as gardening zone 5 and as far south as zone 9. It also has a natural bush form, which makes it ideal for gardeners who want to add one of these plants to the yard, but they don't want to fuss with a trellis or support. The Winter variety also has pretty white flowers that are about half an inch long and emit a pleasant fragrance. Several species were originally imported to North America to use as ornamental plants or to control erosion. They have since proven to be highly invasive, and they should not be planted in gardens. Lonicera japonica, commonly called Japanese Honeysuckle or Hall's Honeysuckle, is a vining variety that is still sometimes sold as a garden plant, but it should not be grown in North America. Two shrub-type varieties, Morrow's (Lonicera morrowii) and Amur (Lonicera maackii), are also invasive species in North America, although they are sometimes still sold as garden shrubs. Lonicera standishii and Lonicera tartarica are considered invasive as well. Goat Honeysuckle - The flowers are borne in clusters, and they're tinted in shade of yellow and blue. They have long tubes and are very fragrant. These vining plants typically bloom in May and June, followed by yellowish berries that develop in autumn. Lonicera Flava - This vine has broad, ovate leaves that are colored pale green beneath. It produces terminal clusters of delightfully fragrant flowers which are a bright, rich yellow that eventually deepen. This variety grows best in North America when it's planted against a sunny wall. Chinese Honeysuckle - This is a beautiful, perennial shrub-type variety that is vigorous and hardy, and it produces large yellow flowers. It grows best when planted in a half-shady location in good, moist loam. Woodbine Honeysuckle - Numerous varieties of this species have sprung up either wild or under cultivation. Some differ in the color of their flowers, while others vary in their blooming season The wild varieties typically produce flowers about midsummer. Whether you choose a vine or bush-type honeysuckle, these plants certainly bring a lot of beauty to nearly any garden setting. Be sure to choose a variety that's known to thrive in your zone, and follow the planting guidelines so you'll be able to enjoy the heavenly scent of these plants for years to come.